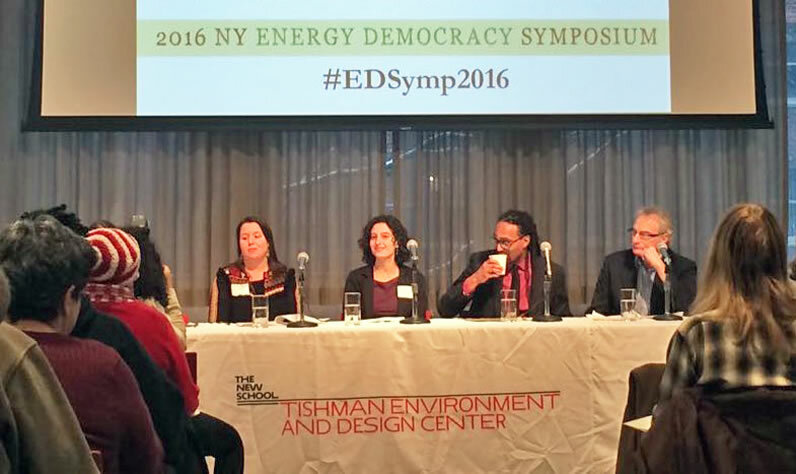 Panelists spoke on the topic "Racing to Energy Democracy" at the 2016 NY Energy Democracy Symposium at The New School. In recent years, energy democracy—the direct involvement of communities in the innovation, planning, and decision making around local renewable energy initiatives—has picked up steam across New York State. But as this movement continues to grow, racial equity and social justice must play a pivotal role in how it takes shape. That was the message from participants in “Racing to Energy Democracy in the U.S. and New York: Why Centering Community, Racial Equity, and Justice Is Critical to a Successful Transition to a New Energy Economy,” one of several panels that comprised the New York Energy Democracy Symposium at The New School. Held at the university’s Theresa Lang Community and Student Center, the all-day event brought experts together to discuss efforts to build locally owned renewable energy projects, make homes warmer and healthier, demand economically and racially just energy policy, challenge the power of utility companies, develop resilient community microgrids, and transition from fossil fuels and nuclear power. Azulay was joined on the morning panel by Ana Baptista, associate director of The New School’s Tishman Environment and Design Center; Eric Walker, Erie County (N.Y.) energy manager; Professor Sean Sweeney, director of the Murphy Institute and Trade Unions for Energy Democracy; and Alison Corwin, program officer at the Surdna Foundation, who served as moderator. During their discussion, panelists delved into current policy interventions within New York, the possibilities for regulatory solutions, and the role of philanthropy in supporting this work. Walker discussed ways communities can shape energy policy, including participation in the New York Public Services Commission (PSC), which regulates and oversees the electric, gas, water, and telecommunication industries. Some activists in the energy democracy movement have called for the implementation of sustainable, off-grid alternatives such as solar power. However, Sweeney stressed that “the push toward renewables should not mean renewables by any means necessary”: For many residents, such alternatives are out of the question because they don’t own their homes or can afford them. The New School, a university dedicated to sustainable practices, was the ideal host for the New York Energy Democracy Symposium. Last year, The New School enacted a comprehensive plan to address climate change, including full divestment from fossil fuels, an expansion of the already diverse catalog of curriculum options for students on the environment and climate justice, and an expanded role for the Tishman Environment and Design Center, a facility that fosters the integration of design strategies and creative social and ecological approaches to environmental issues.